Birds and vegetation are lifelong partners who basically complement each other and that is merely one reason why gardens need birds. A yard with birds is highly gratifying not only because it’s fun to listen to chirping sounds but for the fact that birds play a significant role in de-bugging gardens. If you therefore draw birds to your garden you will have less problems of bugs, worms and insects which do more harm than good. There are many ways to attract birds with one of the simplest ways being use of water. Birds require water to drink and preen and they normally have no special consideration for the type of water feature. This means they can be content with a simple do-it-yourself bird bath the same way they would be with a pump-driven fountain. Bird baths are the simplest features to make since they are basically just a bowl with water and can easily be converted to other complex features. If you have a three feet deep container of any material such as plastic, glass, marble or even a molded one, so long as its durable and safe for birds, then you can easily make your own. There are however some important considerations you may need to observe in order to convince the feathered creatures that your garden is their second home. Proper Siting: If you have a big garden or even a small congested yard, you need to think about where your water feature will be. This is crucial since the birds need to see it and you most probably would like to enjoy the view from a distance. It should also be well situated for cleaning and refilling. For a simple bird bath, it should be near an electrical outlet and within reach of your gardening hose. 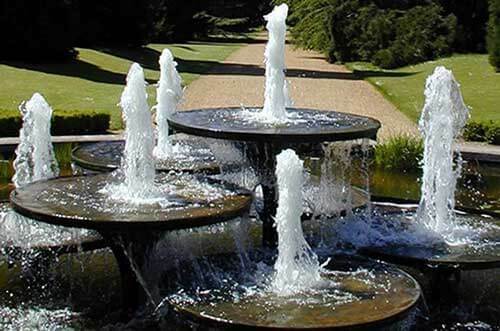 This is key for purposes of connecting small water pumps for water recirculation or even for modification into a fountain as well as providing the needed water. Add Flow: There is something about moving water that just appeals to the eye of not only humans but most living creatures. In the case of birds, the sparkles produced by moving water under sunlight tends to be the catch and that’s why adding flow to your bath draws more of the birdies. You can do this on a very low budget using a simple micro submersible pump to get your water moving. The bath can be setup in various ways using different types and sizes of pumps. Nonetheless, small water pumps are quite capable and can even be fitted with filters to keep recirculating water a bit clean. Keep it Homely: Last but not least, as a capable gardener, you may also consider decorating the water point so that the birds feel secure. You can do this by adding some vegetative shade if there is none around, as this will be their perching ground when scanning around for danger. You can do these implementations without calling anyone although you may need to consult regarding the best small water pumps for your project. Your efforts will duly be rewarded with the presence of happy birds and ultimately, you will not only be helping the birds stay hydrated but also helping Mother Nature.